Mediaspace | A . T . T . N ! Are you looking for professional development opportunities without needing to leave your office? MOQI has just the thing for you. Check out the list of FREE webinars scheduled from January through April. Review the list, find something of interest, and register today. The MN Quality Online Initiative (MOQI) promotes quality course design through professional development and statewide collaboration. In this webinar, participants will learn how to capture a lecture using Mediaspace as well as how to integrate their lectures into D2L Brightspace. This webinar will focus on the technical aspects of recording lectures including audio levels, camera composition, capturing web camera and PowerPoint presentations, editing, machine-close caption the video and share this in D2L Brightspace. Step-by-step guides will be provided. This session will introduce you to different ways to create and organize your course content to improve the learning experience for your students. Tips will include different content creation strategies to improve accessibility and usability. Several different course organization approaches will be shared that will streamline the learning experience for your students including how to link other Brightspace and external tools into your course content area. In this webinar, you will be introduced to several, easy to implement discussion techniques that can be used for any class to increase student engagement. Participants will be introduced to ways you can engage your students with icebreakers to get to know each other, team building, introduce new technologies, hands-on experience with the discussion tool. Participants will also learn how to structure a debate online to increase student critical thinking skills and deepen their knowledge on course topics, incorporate scenario based learning as an effective way for students to apply what they are learning to realistic situation and participants will learn how to create a discussion board in which students can become the expert on a course topic requiring them research, apply concepts and examples. Templates, assignment directions and examples will be provided. 1. Discuss techniques for increasing engagement using the discussion board. 2. Utilize planning worksheets and templates to implement discussion board concepts. 3. Increase student engagement with discussion boards. In this webinar, participants will learn the difference between the accessible course design and Universal Design for Learning (UDL). They will review the important role faculty play in designing courses that are accessible and inclusive. Principles of UDL will be introduced. Participants will learn about how to create accessible course content using Word, PowerPoint, Mediaspace, and D2L Brightspace files. Handouts and guides will be provided. 1. Explain the difference between and main concepts of accessible course design, accommodation, and Universal Design Learning principles. 2. Identify several strategies for implementing UDL principles in your own course. 3. Create accessible course content including course documents (Word, PowerPoint, PDF), video captioning in Mediaspace, and content pages in Brightspace. Well-written learning objectives establish the foundation upon which courses are designed and delivered. They form the basis for the instructional materials and assessments that are included in the course. Learning Objectives serve as an implied contract between the instructor and student by defining what is to be taught and what is to be learned, so communicating these objectives clearly is a crucial step in assuring an effective learning experience. This session will review best practices for creating and sharing measurable learning objectives in your online or blended course. Assessment, Evaluation, and Testing are often used interchangeably. What do we mean when we talk about formative assessment, summative assessment, aligned assessment, and evaluation? Is that the same as testing? Assessment is a crucial part of any course because it allows your students to demonstrate mastery of the learning objectives. But how do you know what type of assessment to choose? This session will feature practical information and skills needed to produce high-quality and polished recorded lectures. In addition to a review of PowerPoint fundamentals and design, participants will learn what makes a clear and engaging recorded lecture, how to fine-tune delivery, what to capture and best practices from the broadcast industry and on-air presence. This session will focus on the pedagogy of recorded lectures not the technology. Templates and handouts for producing recorded lectures will be provided. 1. Describe PowerPoint design elements: theme, images, accessibility features, and use of master templates. 2. Create a video outline for instructional videos. 3. Utilize a planning document to produce effective recorded lectures. 4. Apply broadcast industry best practices for recorded lectures. 1. Utilize Mediaspace to record lectures including web camera and presentations. 2. Share recorded lectures in D2L Brightspace. There are plenty of options when you work in your course to create a file and edit it in the HTML editor. 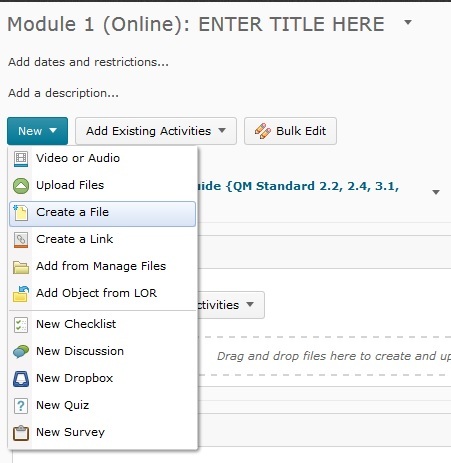 When you go to a specific content module you have created in your course, for example Week 1 (under Materials > Content > “Week 1”) you get the Upload /Create button. By clicking on it you get several options, where the second option is commonly used to upload your syllabi or any other file, and then the third option is Create a File. Once you click on Create a file you get a window, as shown below, that is the HTML editor with myriads of editing options that make it easy to work in right from D2l Brightspace. The first tool, called “Insert Stuff” (marked red on the picture below) is how you insert media to your new file. Further below is a list of inserting media options with descriptions. Click the Insert Stuff icon. Select My Computer to browse and select a file from your computer. After you select a file, click Choose Destination to select and create a storage location for the file. 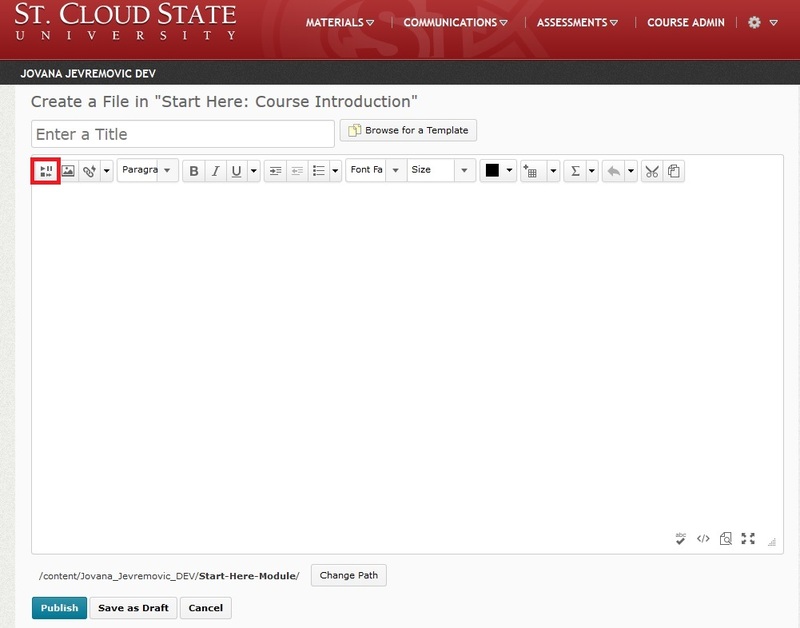 Click Course Offering Files to browse and select a file from your computer. Select your file from the file directory and click Upload to upload a file to the directory. You can also select a file type from the Media Type drop-down list and click Apply to filter your directory search. After you choose a file, click Next. Type a Link Text and an Alternate Text. Click Learning Repository to browse available learning object repositories for objects and assets. Select your file from the repository and click Next. Enter a Link Text and an Alternate Text. If you text is decorative, you can select the This is decorative checkbox to avoid entering alternative text. Select Start playing automatically if you want your media file to play as soon as the content item opens. Note: St. Cloud State D2L Brightspace has the My Media integration with Kaltura Mediaspace. 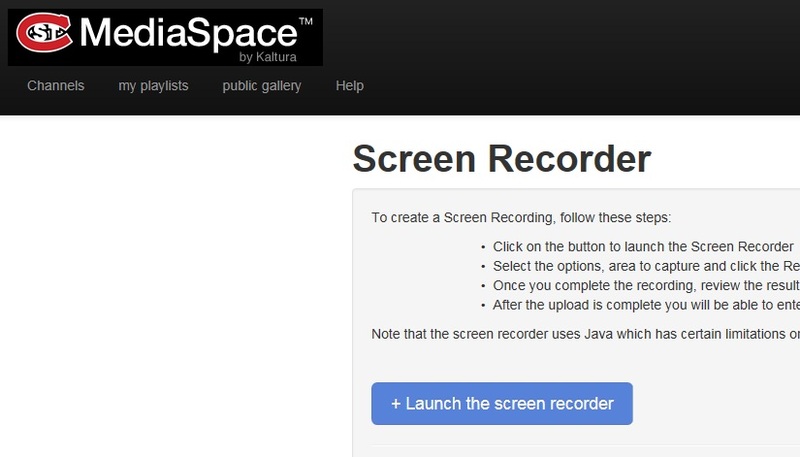 Once you click on it, you are able to Add New Webcam Recording or Upload Media from your Mediaspace library. Click My Media. 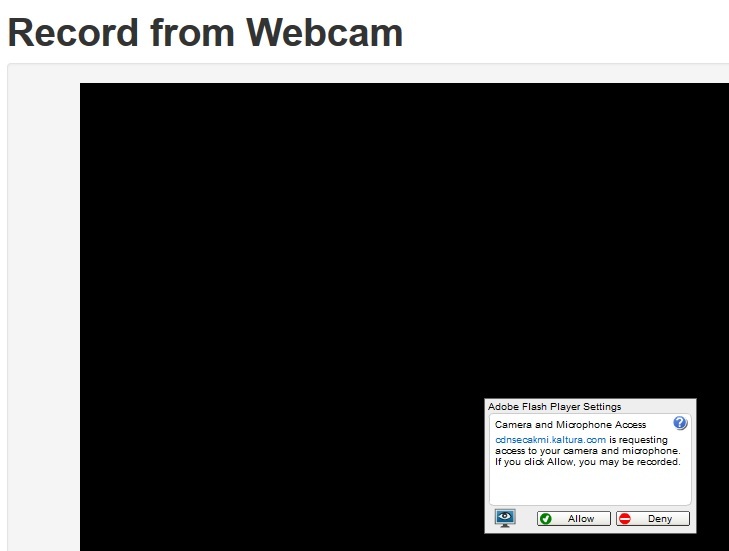 Click Add New > Webcam Recording. Click Allow if the Flash player prompts you to allow camera and microphone access. Click Record and record your video. Click Stop when you finish recording. You can click Play to preview your video notes. If you want to re-record, click Clear. If you are satisfied with your recording, click Next. Enter a Title and an Description of your videos. You can preview the video notes before you insert it. Click YouTube to browse and select a video you want to insert. Click Next. 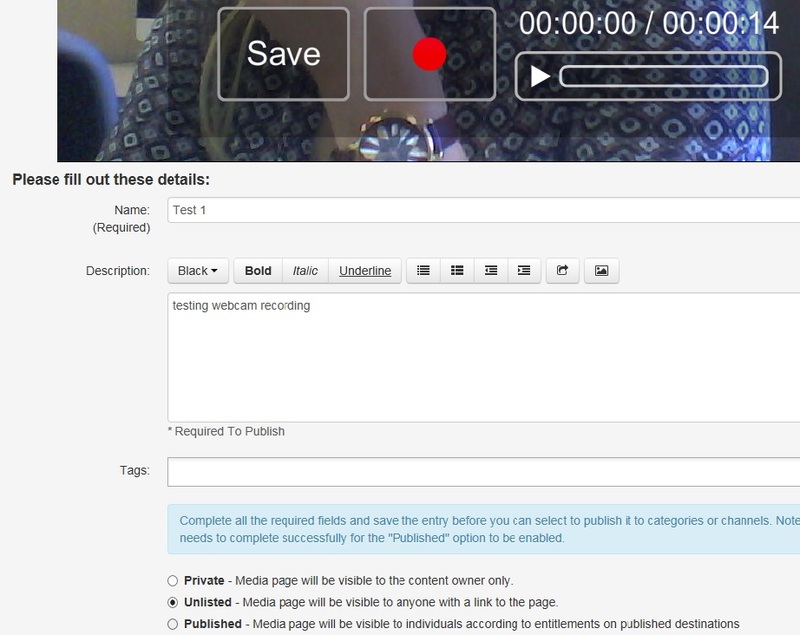 You can preview the YouTube video from the YouTube Properties page. Click Insert Link to insert the URL for an online media file. Enter the URL in the URL field and click Next. 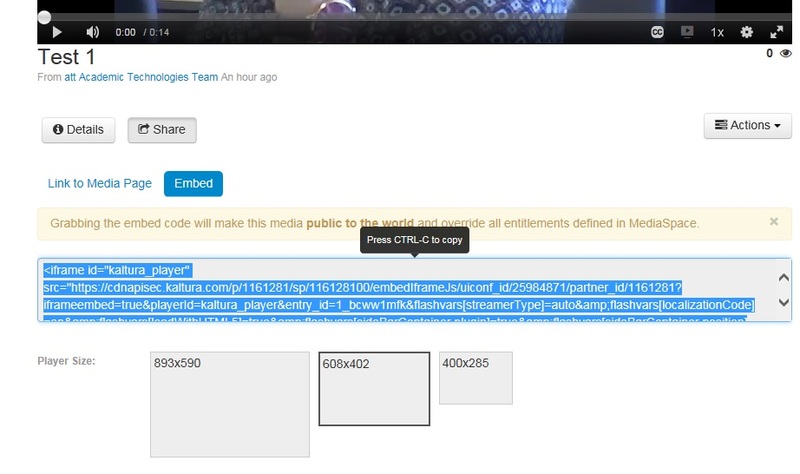 Paste the embed code you have previously copied from your Mediaspace Kaltura. Faculty can use the D2L Brightspace Gradebook to upload their final class grades to the E- services website (ISRS) quickly and efficiently, thereby saving an estimated 15 hours per semester. SCSU’s Academic Technologies Team -D2L Administrators and Instructional Designers – will demonstrate how the Gradebook integrates with E -services. Following the session, instructors can arrange an individual session with one of them for further training and support. MediaSpace™ by Kaltura, available to all SCSU Faculty, allows users to record audio, video, or capture anything on their computer screen. 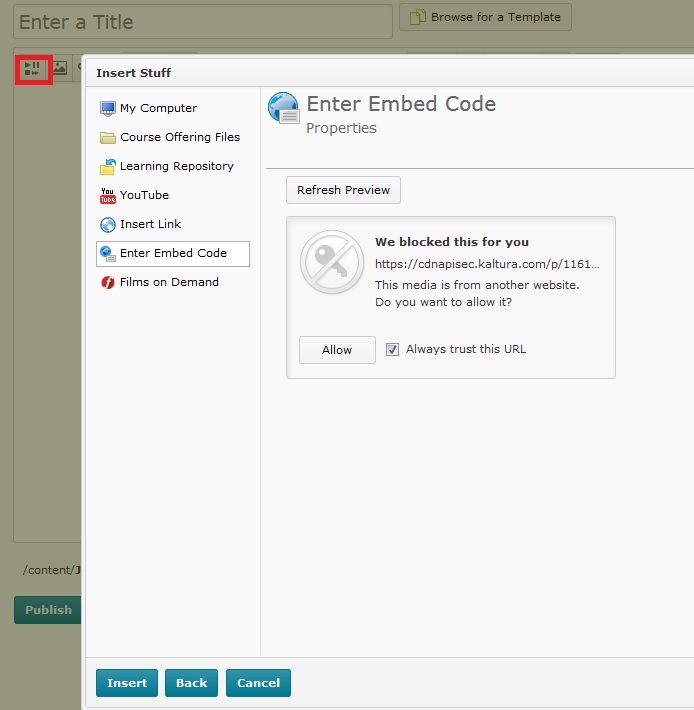 The recording can be then streamed and shared in a D2L Brightspace course shell or via email. In this session, participants will learn how to make the best use of this tool in their work. In addition, they will be able to arrange an individual training/support session with one of the SCSU Academic Technologies Team’s MediaSpace™ trainers.